A Bristol pilot project which explores how smart technology can directly benefit city residents has been recognised at the European-wide Green Digital Charter Awards. The project, called REPLICATE, is led by Bristol City Council and aims to help people save energy, rethink transport choices and use infrastructure in new ways. The five-year project will look at how smart technology can be deployed in the Ashley, Easton and Lawrence Hill ward of the city. Local business and residents will have the opportunity to access 32 e-bikes, 6 electric car club vehicles and an on-demand ‘bus taxi’ with apps being developed to help with parking and transport options. Smart white goods such as fridges and washing machines will be installed in some homes with 240 of them undergoing energy refitting, including 150 connected ‘smart homes’. Teams across Bristol City Council are working in partnership with the city’s two Universities and seven other local partners on the project, which is funded by the European Commission. Findings will be shared with other cities who may replicate successful approaches. The award was picked up by Paul Davies, Head of the Bristol Brussels Office and the council’s first representative in the EU capital. In Bristol the project is led by the City Innovation team; Luke Loveridge (Programme Manager) and Catherine Makin (Project Manager). 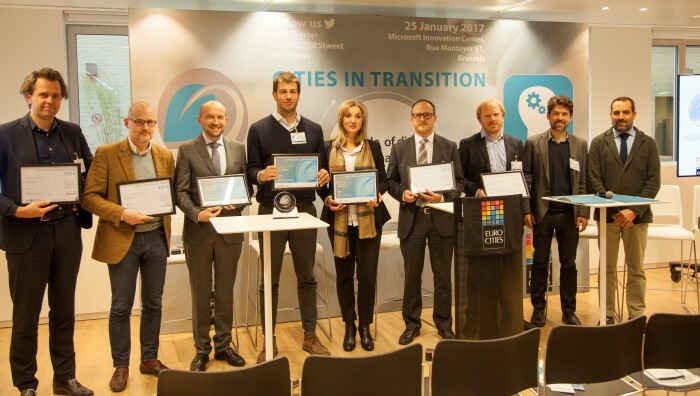 The Green Digital Charter Awards took place on 25 January 2017 at a ceremony in Brussels. The other runners up in the Green Digital Charter (GDC) Awards were Amsterdam, Reykjavik, Utrecht, Zagreb and Valencia. The winners of the award were Zaragoza, Lisbon and Rijeka. This project is part of a wider European project under the umbrella of REnaissance in PLaces with Innovative Citizenship And TEchnology (REPLICATE). REPLICATE is part of the EU’s Horizon 2020 innovation programme with €25 million awarded to all the participating cities and €7 million granted to the Bristol pilot. Alongside Florence and San Sebastián, Bristol is a Smart City ‘Lighthouse’, leading the way in implementing smart technologies. There are also three ‘follower’ cities which aim to replicate findings and approaches from the REPLICATE project; these are Essen (Germany), Lausanne (Switzerland) and Nilufer (Turkey). There are also two ‘observer’ cities’; Bristol’s twin city Guangzhou (China) and Bogota (Columbia).